Check out the new Store Showcase for Bodies Ready to Ship! Check out our hand made bodies. 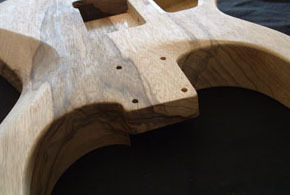 We only use center joined pieces of select wood for our custom 2 piece bodies. One piece bodies are available if you prefer. You can choose from Alder, Korina, Maple, Mahogany, Padauk, Swamp Ash, Basswood, Flamed Maple, Quilted Maple or Poplar. 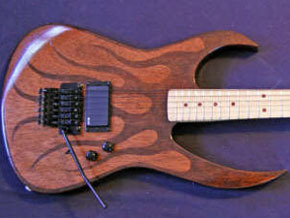 We also offer Flamed Maple Tops! We can do several different body shapes or even your own design. If you can't find what you are looking for contact us. You will be pleasantly surprised by our prices and our service. What do they say about Mojo Bodies? "This is the best-looking guitar body I have ever seen. Great job-- the EMG pickups fit perfectly. I can't wait to get the _next_ one"
"Got the body today and it's beautiful." "I recieved the body. Looks Great. MY Mighty Mite neck fits tight. Nice light weight. All the mods were done like I wanted. GREAT JOB!" Man the body is awesome!!!!! The body is great, damn nice job! Check out what our customers are doing with their Mojo Bodies.The Mahogany Body pictured on the right is the finished product from the body featured in the Gallery section. A lot of new pictures have been added over the last couple of weeks. Introducing the I-RG. Our latest addition to our growing line of Mojo Bodies. 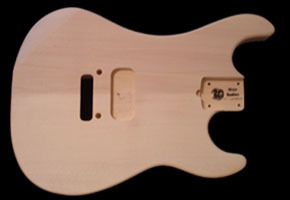 This body features a deeper lower cutaway. It's perfect for a 22 fret neck or a 24 fret neck with an extension. 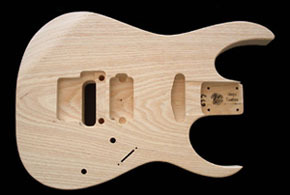 It's pictured in Swamp Ash with a recessed Floyd Rose rout and fretboard recess. Introducing the Custom Comfort Contour Heel option. It tapers at the lower corner of the heel for easier upper fret access and a sleeker look than our regular scalloped heel. Ask for it for you next custom body from Mojo Bodies. Introducing the SD-MM. Our latest addition to our growing line of Mojo Bodies. This body features a longer lower horn. 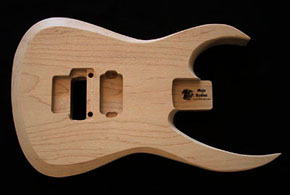 It's pictured in Maple with bevels and a recessed Floyd Rose rout. Our K 51-50 body will take you back to the 80's when the Hot Rod Guitar became common on MTV. Remember the guitars your favorite players used to be up on stage with. From simple oil fioninsh to wild graphics. Get the body with the Mojo to capture the magic of the 80's. Nothing sets off your body like a beautiful figured top. 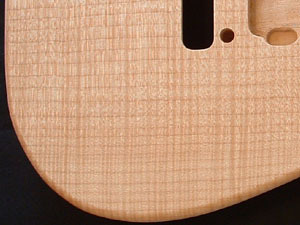 We offer veneer to 1" thick figured maple tops. Take a look at the tops we have in stock. If you want something different please contact us. 3/8" Quilt Top SDT pictured. Please email to place an order and reserve one of these fine pieces for you next Mojo Body. Check out these great lessons!! Enter the code FreeShip11 into the coupon window when placing your order for free shipping on any lessons from Metal Method. This offer is only good through the month of August! "The Complete Basic Course was chosen by Guitar World Magazine as an essential guitar DVD course."